Following their deadly confrontation with the Magister’s clockwork automatons, the Shadowhunters launch an exhaustive investigation into his past as they desperately try to locate him. 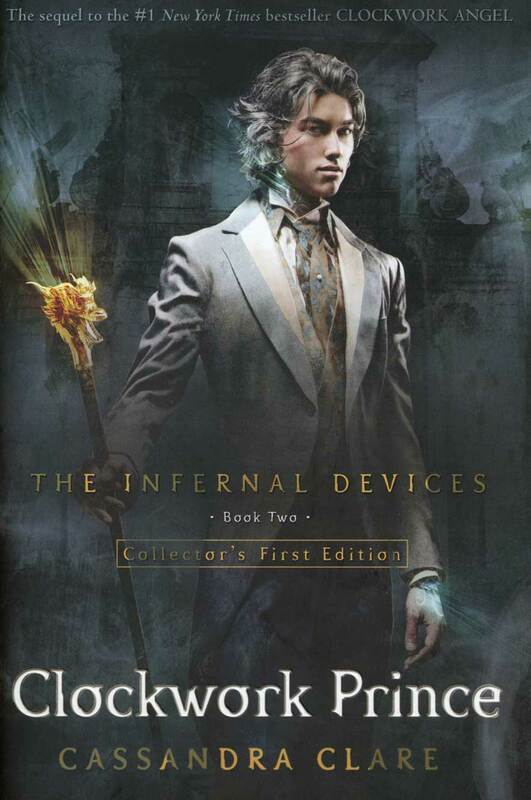 Charlotte’s leadership of the London Institute hinges on success; if the Shadowhunters fail to uncover the Magister’s whereabouts, Will, Jem, and Tessa may find themselves no longer calling the Institute their home. The three soon learn that not only has the Magister concealed himself very well, but he also seems to have anticipated every avenue they would explore in their search for him and has taken preemptive action against them. With the Council’s deadline fast approaching, the Shadowhunters must discover a way to overcome the firm upper hand that the Magister currently holds against them. Having reread both this and Clockwork Angel now, I must say, they’re just as riveting to read a second time as they were originally. In fact, I think this is a series that only gets better with each successive read. There are quite a few books that, at the time I’d finished them, I pictured myself reading over and over again. When I look back at them now, I can’t say that anymore. 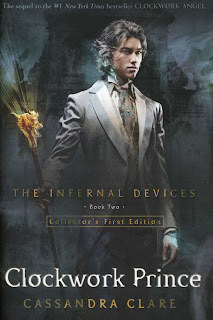 I can with certainty, however, envision rereading The Infernal Devices multiple times and discovering something new to love about the series each time. Once again, Clockwork Prince made me laugh, broke my heart, and kept me up reading late into the night, and I relished every page. I first read this when it was released in December, 2011, about six months after reading Clockwork Angel. Even with the time gap between the books, slipping back into the world of the Victorian-era Shadowhunters was effortless; it was like no time had passed at all. The first chapter opens with a lovely scene between Jem and Tessa, in which the two pay a quick visit to Poets’ Corner in Westminster Abbey on their way to a Council meeting. Charlotte and Henry’s ability to run the London Institute has been called into question following the attack on the Institute by the Magister’s clockwork automatons. Well, it’s Charlotte’s fitness to lead that’s under scrutiny here, as everyone knows that Henry is pretty much co-head in name only. Charlotte is given two weeks to produce the location of the Magister, or she’ll likely be removed from her position. The search for the Magister drives the novel, which is as superb as its predecessor in every single way. There’s thrilling action, treachery, Will’s humor, and heartbreak so painful that it shredded my heart all over again even though I knew to expect it this time. Numerous were the times while reading Clockwork Prince when I felt as though an invisible fist had seized hold of my heart and was trying to squeeze it to a pulp. James Carstairs has to be one of the sweetest, kindest characters I’ve ever read about. The courage and dignity with which he accepts his fate just render me speechless. I want so badly to see him happy, to somehow make things right for someone whose inherent goodness deserves so much more than the cruel hand he’s been dealt. You know you’ve made a lifelong friend out of a book when you get this emotional about one of its characters. In the case of this series, I get ridiculously emotional about almost all of the characters. Jem and Will are opposites in so many ways, and this was especially evident in how each tugged at my heart. Jem, the epitome of chivalry, made it flutter, while Will, in one particularly gut-wrenching story line, shattered it. Will, who’s hiding a secret that has forced him to push away just about anyone who has tried to care for him, hits rock bottom here, and it’s agonizing to see. Even when a glimmer of hope appears, Will’s happiness is short-lived because it comes at the cost of denying the happiness of another. The emotional turmoil in this book was just unbearable at times, this being one of those times. Tessa, too, finds herself swimming in stormy thoughts. She has to come to terms with what her brother, whom she still cannot completely bring herself to hate, has done. She receives some possible clues to what she is, but they don’t add up. And, worst of all, she might be that which divides two boys who love each other like brothers. Tessa bears it all pretty well, considering how much she’s grappling with. The Institute has truly become a home to her and its residents like a family, and Tessa doesn’t hesitate to throw herself in the path of danger to help them however she can. Clockwork Prince is one insane ride of emotions that does not quit until the final printed word. And this is the middle book in the series! The middle book! There’s still one more to go! Yep, I loved this one with all my heart, too. I get completely lost in these books when I read them. This series just strikes all the right notes for me. I can't wait to hear what you think of it! Definitely! I kind of want to reread the whole series from the beginning because I still can't believe it's over!